Cat with behavior problems.. Garvin recommends the opposite of other local experts and saves cats life. An experienced trainer made the difference! The Life of a Service Dog! I’m just writing to say thanks. About 8 years ago, you helped us train our dog, Xena. 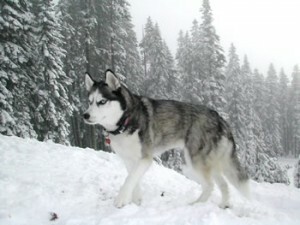 I had owned many other dogs before, but never a Siberian Husky. None of my previous experience at dog training was working with this one. The cost of your training seemed like a lot at the time. It has proven to be a bargain. Xena is the best dog I have ever owned. We can trust her off leash in wilderness settings (NEVER around traffic however). I often take her kayaking with me and when she gets tired of riding in the boat, I let her run along the shore while I paddle. She pays attention to where I am and stays in sight. She will sometimes chase after a deer, but after a short while she comes back. We could never have gotten her to this level of obedience without your help. As you may recall, she is a very willful animal. One of the tricks you helped us teach her was “Find Casey”. We moved to Redding California about 5 years ago. The first summer here, we went on a hike in the Castle Crags. Casey was about 9 at the time. Feeling like a big boy, he went ahead of us down the trail and out of sight. The trail was well marked so we weren’t worried, until we came to an overlook where we could see a long way down the trail with Casey nowhere in sight. We had noticed that Xena had been getting kind of agitated as we had been walking. When we realized Casey was lost, we were in a full-on panic. We told Xena “Find Casey”. She took off back up the trail to a switchback. From there, she cut diagonnally across a steep scree slope disappeared into a grove of trees at least a quarter mile from where we were standing. In a few minutes, she reappeared, with Casey following. He had taken a wrong turn and was on a trail leading in the opposite direction from us. We were already a quarter mile apart, the wind was blowing, and he was out of earshot. He realized he was lost and had sense enough to follow Xena after she caught up to him. This could have been a very serious situation in another couple of hours when the sun went down. Needless to say, she got LOTS of treats for that trick. I’ve attached a photo of her from about a year ago. She’s 8 now, but looks and acts like a much younger dog. Hope things are going well for you in Tucson. Look us up and come and say hi to Xena if you are ever passing through Redding. When I was a little girl all I ever wanted had to do with dogs, whether it was checking out really big dog books from the library or playing with dogs at the dog park. I would come home and dream about having my own dog.. thinking how amazing it would be to own my very own. One magical evening Duchess my American Eskimo Dog came to me.. it turned my life around forever, and I will never forget the night at the airport seeing her for the first time. It was the happiest day of my life. Since she was MY dog it was my job to train her. We looked everywhere but no one would take me at ten years old, Then we found Garvin’s.. you agreed to take me. That’s when I found what I wanted to do for the rest of my life… and I still think that. I wanted to be a dog trainer.. at the time Moria was my idol.. she did everything for me. taught me how to handle Duchess, and how to respond to other dogs. she taught me about controlling energies which is a major difference in how a dog will act around you. Duchess and I grew with experience and challenges, rewards and companionship. She became the dog I had always dreamed of. When you said I could help out at Dog Day C.A.R.E I was sort of nervous.. I had no idea what to expect! my first couple of days it was just getting to know all of the dogs.. and people. I made a lot of friends there and it has inspired me a lot! My favorite person there is Brenda. She has encouraged me to do so much and has cheered me on through everything. She asked me to train this pit-bull we found, so I went ahead and taught him how to sit, down, go to your spot, and leave it. Brenda also kept telling me about a Border Collie named Ceana (Kena) and how she would be outstanding in agility. I finally got to meet Ceana and fell in love with her at first sight. She was the smartest dog I had ever met! I told Brenda I would defiantly volunteer to run her in agility if she ever did agility. Soon Ceanas mom took her into agility, I came the night and her mom let me run her! I had so much fun I came back the next time. So now I am running Ceana and having the time of my life! Thank you so much Karyn for letting me come to Dog Day C.A.R.E. it is the most fun I’ve ever had!!! to help us train Zona, our 1 year old Golden Retriever. We originally thought we wanted a trainer who used the “clicker” method exclusively. But after a 1hr. lesson in our home with one of these trainers, our dog had learned basically nothing. So we started our search for a different trainer. That’s when we were referred to Garvin’s Pet Training. Karyn uses the clicker in her training while integrating other methods as well. She is positive, loving and considerate as well as firm in a way that is extremely effective. Her knowledge and understanding of dog behavior is outstanding. We really liked her common sense approach to training. Watching her train our dog was an absolute delight. After just two 1hr. lessons our dog knows how to walk on a loose leash, how to “go to her place” and lay down, how to “Go around” , sit and stay and all off leash. We didn’t think this was possible with our somewhat stubborn dog that has strong ideas about what she will or will not do! We couldn’t be more pleased at the amazing progress both we and our dog have made in two lessons. I adopted a young Aussie, Kayla. She is a perfect companion – smart, playful and very loving. She had just one bad habit. Whenever she wanted your attention, she would paw at you. Now, when I say paw, I mean she would club you with her paw leaving bruises and scratches. Having two other dogs and two cats, that were also trying to get attention, it became a real problem often ending with me yelling at her and sending her away, robbing both of us quality time together. Being a very smart dog, I knew she could learn how to stop this behavior. I just didn’t know how to teach her. In just one private session with Karyn, she taught me how to give an effective correction. I learned that yelling was not an effective consequence! She also showed me how to reward Kayla for appropriate behavior and in just this one session, Kayla understood what was being asked of her. Now, just a couple weeks later, Kayla seldom has to be corrected. I am able to truly enjoy her company lying in bed or her just lying at my feet. She is everything I could ask for in a dog. As an attorney in private practice married to a busy doctor, I was overwhelmed with four puppies. I signed them up for training with Karyn and found out two days later that I was pregnant. At this point, overwhelmed was an understatement! Intellectually, I grasp the ideas behind dog training. I’ve seen T.V. shows and read books, but putting it all into practice left me feeling like an incompetent mother. I immediately saw drastic changes in their house breaking, barking and obedience, but felt frustrated when I had to take the dogs in public. I disregarded Karyn’s suggestions, gave up on her methods, and let the dogs take complete control of me. I came to the next training session outwardly defeated. Karyn picked up on this immediately. I let her know that I was considering giving away at least one of my dogs. I broke down crying (which is so unlike me!). Karyn offered me several options. She walked me through my fear patiently but sternly, paying attention to the seriousness of the situation. All at once, I felt as if I had a true support system in place with Karyn and her staff. I also saw that much of the problem was rooted in my attitude. I left a few hours later feeling a burden lifted and newfound confidence in myself. With support and coaching from Karyn everything started to fall in place fluidly and just seemed to click. My anxiety dissipated and my dogs’ attitudes changed drastically! I really believe in Karyn and realize that sometimes owners may need a little more training then their dogs! Thank You Garvin’s Pet Training! My dog is now 7 years old and finally, I learned the truth about her!!! I scheduled a private lesson at Garvin’s Pet Training because, as I told them over the phone, my dog has separation anxiety. Ever since my dog was a puppy, she has destroyed window coverings at each home we moved to. Since this only occurred when we were gone, all the experts I talked to and the literature I read called it separation anxiety. There was very little that I could do about it since my wife and I had to go to work. We loved our dog and just hung in there. Typically, after several months of living at a new place, she seemed to settle in and the destruction would end; but, if we dared to move, it started all over again. Recently, I needed her to stay at my mother‘s house and sure enough, she destroyed my mother’s window coverings as well. That’s when I called Garvin’s Pet Training. It only took Karyn a few minutes to tell me it wasn’t separation anxiety, but rather, a symptom of containment anxiety. My dog had a fear of being trapped. The reason she only destroyed the window coverings was because her destruction was in relationship to trying to escape. Karyn proceeded to tell me that if Roxy had a dog door that would allow her the freedom to go outside and come inside when she wanted, the destruction to the window coverings would end. It only took me a moment to put two and two together and know that what she was saying was true. With the separation anxiety diagnosis, I had thought the reason Roxy was destroying window coverings was because she was at the window looking for me. There was nothing I could do to change that. Then I suddenly remembered how, at the last house – that she was destroying – we had put in a dog door for our senior dog that had bladder control issues, and sure enough, all of Roxy’s destructive behavior stopped immediately. I still can’t believe it. After all the money we wasted and all the destruction we incurred, all we needed was a dog door. I’m glad Garvin’s knows what they’re talking about since none of the other “experts” did! I just wanted to say thanks for a wonderful informative class. I can honestly say, that even though I was born with a dog in my hands and spent 2 years as a vet tech, I still learned a great deal about dogs in general, about myself and about Duke. Christina is a fantastic trainer. She not only makes it fun, enjoyable and low stress for the dogs but for their owners as well. She has a wonderful ability to “correct” owners in a manner that is not only helpful but also leaves you feeling good about the lesson learned. As an instructor and supervisor, I feel this is a necessary technique to understand when teaching. I was extremely pleased with her faith in Duke and I when i had doubts. He really enjoyed playtime! Please let me know when the next level class begins. Duke has come a long way since the first day of class and I look forward to learning more from Christina and continuing to help Duke grow. I know Duke also looks forward to seeing his friends Nala, Rocky (aka Noodles) and Sid, who I think learned a lot from playing with Duke and helped him to do a little learning too. I hope they all sign up for the next class as well. Just wanted to let you know that this week Sparky passed the Canine Good Citizen test. Your obedience classes that he took 2 years ago were perfect preparation and covered all aspects of the test. Amazingly Sparky remembered it all! In fact the test giver said he did the best of any dog she has tested so far. We are very proud of our boy and happy with the training he got at Garvin’s. Hope all is well with you and Luke. My cat had severe behavioral problems. Two vets, and I had all given up on her. We were discussing putting her to sleep. In desperation I called Karyn. The other experts had told me not to look my cat in the eye and to avoid confrontation. They also prescribed drugs. Karyn, after having met my cat suggested just the opposite. She reminded me that eye contact is the first step in a relationship. Rather than avoiding the cat and acting afraid she explained how this was indeed making me a target. She showed me how a simple tool like the squirt bottle was a very effective consequence. I had a new tool and a defense system. I was to squirt my cat for inappropriate aggressive behavior and to quit acting afraid. I was also instructed on clicker training and shown how to reward appropriate behavior. She gave me tough love. She pointed out that I was acting like a scared cat and had lost respect. She told me what to do and now my cat is absolutely perfect! Thank you so much, Karyn. Please contact me for more clicker training. Not too long ago, we had become frustrated with Roman, our frequently out-of-control German Shepherd. After many years of wanting a German Shepherd, we finally found Roman and brought him home when he was two months old. Since we were determined to have the most obedient and well trained dog, we purchased training videos specifically geared to the GS dog as well many books focusing on dog behavior. We were “well read” and thought training Roman would be a piece of cake, but we soon learned otherwise. As Roman grew in size and strength, he became physically harder to handle. We wrongly assumed that we needed to be more dominant and forceful with him (the main method of our “training” videos and books) to curb his boisterous behavior, but it only made him angry and more rebellious to our commands. He would frequently take a nip at us as if to say “don’t mess with me”. Our walks with him must have been sadly comical to observers ……..Roman would drag us wherever he wanted to go. We had absolutely no control over this 115 pound muscle machine. By the time Roman was 1½ years old we had become totally exasperated. What we were doing wasn’t working, and we realized that we needed help. Two neighbors recommended that we see Karyn, so without hesitation we set up an initial consultation with her to see if she could help us. Roman wasn’t especially keen to take orders from anyone and at one point during our visit he was a bit testy and nippy with her, although Karyn diffused the situation quickly. Karyn had a sense that he had been inappropriately disciplined with incorrect training methods and that with guidance we could “reprogram” his learned negative behavior. So began our journey to a kinder and gentler Roman. For the following three months we met with her for private obedience training. It was as if a light bulb came on, our blinders were taken off, and we saw “what could be” all at once. Within one week our walks with Roman became joyful and pleasant. Roman has learned to be patient and no longer nips. He is now disciplined, obeys our commands, and has become the emotionally balanced companion that we always wanted and knew he could be. We have also learned much about our own behavior and how our passive attitude and fear contributed to a misbehaving dog. We now treat Roman with respect and he respects us back. Funny how that works! We no longer fear him…….trust is part of our relationship now. Anger, on both sides, is gone. Roman is continuing further training in group lessons and absolutely loves the interaction with fellow canine buddies in a group setting. Karyn’s insightfulness and knowledge as a dog trainer are tops. Additionally, her calm and patient attitude creates an effective training environment for both dog and owner. Her work with us was the perfect blend of physical training and emotional education needed not only for Roman but his (now wiser) parents. While it’s true that many things can be learned by reading, it has been our experience that books and videos are simply no substitute for hands on training with instant feedback from Karyn. We now have a happy, well-adjusted Gentle Giant and we’re much happier too! Thank you Karyn! On our very first “real” walk together, I learned Gecko was severely aggressive towards other animals, especially dogs; moreover, when she was in a fit of rage, she began to re-direct/displace her aggression towards me when I intervened! As time went on, creosote bushes, chain link fencing, a PetsMart associate, and I were all bitten by this temporarily insane dog. 1) Return Gecko to the Humane Society. 2) Re-home her to a no-kill rehabilitation facility. 3) Keep her, learn some new skill sets, and continually manage her inappropriate behaviors. I did not choose #1 because I had a strong feeling she’d be humanely euthanized (Hmmm, a returned aggressive pit bull…). I earnestly tried #2, and Best Friends Animal Society in Kanab, Utah truly wanted to help us, but they lacked the space and resources necessary to give her a forever home. I went with #3. For somebody who had never before needed to deal with canine behavioral issues, I was unknowingly about to start down quite a path. I started by talking with all my dog-savvy friends. Surprisingly, some had a lot of experience with inter-dog aggression, others connected me with good, knowledgeable people, and all were wonderfully helpful in their unique ways. I also read several books on the subject. But I was still struggling to identify the optimal plan of action. Meanwhile, Gecko was still engaging in daily fits of rage when she saw other dogs on our walks, and I was desperately trying to prevent dog bites. Leaving our one-bedroom apartment to walk/run for 2+ hours each day (1+ hour in the A.M. and 1+ hour in the P.M.) had become cumbersome and punitive. I began to lose it both emotionally and physically. Due to decent networking, I was able to assemble a solid list of professionals who might be able to help us. I systematically called each and every one of them: a general D.V.M., a D.V.M. 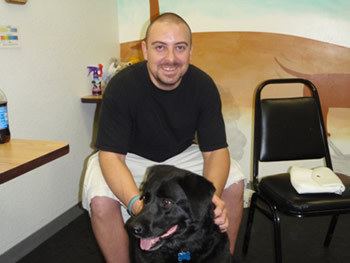 specializing in behavior, a local “Dog Whisperer” guy, an animal communicator, a canine behavior counselor, and several dog trainers. Some took days to return my call, so I plowed forward and followed through with those willing to work with us…for a hefty fee. I spent a lot of money, yet was not satisfied with the methods or tools offered. For example, the veterinary behaviorist suggested avoiding all other dogs and putting Gecko on Prozac right away. Unless you live in a bubble, how can you realistically avoid all other dogs? Or, do you spend your life together doing U turns and running away? I also started learning what physical tools were grossly ineffective for a young, healthy, strong, aggressive pit bull: traditional neck collars, every single type of harness, and head collars. I did, however, delve into the world of basket muzzles and this was a bright spot – at least I could keep myself and others physically safe when we were out in the community! 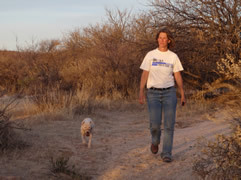 To this point, of all the people we worked with, one stood out: Lynn, the canine behavior counselor. She was at our apartment for an assessment within hours of my call. 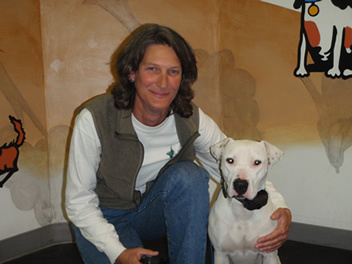 Lynn, the owner of four pit bulls, and tightly aligned with the methodology of Cesar Millan, immediately made a positive impact on our situation. Namely, she introduced us to Millan’s Illusion collar – a slip lead that physically stays in position right behind the dog’s mandible instead of sliding down around their trachea. Also, she taught us how to use it in real time, with real dogs who also happened to be on a walk in our neighborhood. The key was to consistently and swiftly “pop” the dog’s attention back to you at the first glimmer of distraction. This approach was definitely a step forward relative to what we had been doing, and we embraced it. As the months past, however, Gecko’s aggressive behavior was not dissipating; in fact, the “correction” with this collar caused it to escalate. On several occasions, I had to “correct” her aggressively merely to regain control. And even though she was muzzled, her re-directed rage towards me was very disturbing. I wasn’t certain how Gecko felt about things, but I felt like I was living a dog walking nightmare twice a day, every single day! We had worked diligently and reached a plateau, yet discordance was still quite evident and stagnation was setting in, so I called Lynn, wondering if this was as good as it was ever going to get. Lynn said, “Gecko’s just not getting it.” Oddly, I was relieved to hear those words because it meant we might have the opportunity to take our challenge to the next level and get the kind of help we desperately needed. Sure enough, the turning point came when Lynn referred us to Karyn Garvin. 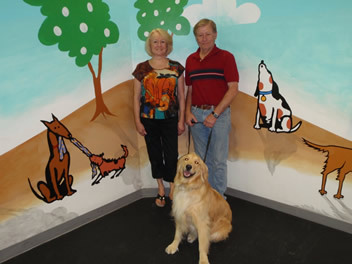 Lynn had worked with several people at Garvin’s Pet Training for obedience, reactive dog, and agility training, and highly recommended them based on the results she had received. Finally, on November 10th, 2008, I called – we met with Karyn for our initial consultation later that afternoon. It didn’t take Karyn long to size us up: Gecko was dangerous, our equipment was marginal, and my handling skills were poor. On that very first day, after learning about everything that had been tried thus far, Karyn recommended private obedience lessons and the electronic collar (e-collar). Things got off to a bumpy start. Despite Karyn’s experience and expertise, I was reluctant to utilize the e-collar. I was aware of some of the different approaches to dog training because I had read all those books recently, so now I was overwhelmed and uncertain. The positive reinforcement camp condemned the use of any punishment, and the Garvin camp planned to blend both positive reinforcement and “corrections” to modify her behavior. Admittedly, I had preconceived notions about the “shock collar” as well. Honestly, the words cruel and abusive came to mind. I had Gecko’s best interest at heart and felt utterly unsure about this decision – I came within an eyelash of just walking away. Karyn encouraged me to go home and sleep on it. I called Karyn back two days after our consultation to discuss things because this had become an agonizing decision for me…and Karyn was ready to get started! During this next hour-long conversation, I told Karyn I did not want to shock my dog, I did not want to break her spirit, and I did not want to possibly exacerbate her aggression. Karyn’s response was honest and very to the point, yet kind. She told me she could not guarantee total extinction of Gecko’s inter-dog aggression, but she promised to “bring everything” to this challenging endeavor and make improvements. Furthermore, she informed me that most dogs did not require undesirable consequences, but some definitely needed them; powerful, aggressive, high-energy breeds were special cases. Gecko was in this category. With her thirty years of dog training experience, Karyn told me she would eventually uncover the core of Gecko’s aggression, whether her dog aggression was locked up in her genetic code, or, if she aggressed due to prior conditioning. By the same token, she would eventually identify what made Gecko tick, and utilize this to help Gecko learn new, more appropriate behaviors. As this conversation progressed, the quality of my life was addressed as well. Karyn would not allow me to forfeit my well-being for the sake of Gecko’s well-being…striving for balance was key and harmony the ultimate goal. Karyn reminded me of our current situation and simply asked if I wanted help initiating positive change. It was a simple yes/no question – if you want my help, stay the course; if you don’t want my help, leave. Karyn was telling me things that made perfect sense logically, but this was more of an emotional conflict for me. Then, she said something that really struck a chord: Karyn said I needed to at least try her approach to this dilemma. She went on to say that success was not a given, but I would know in my heart of hearts that I gave it the best effort possible. That was it, she had done it…Karyn successfully “talked me off the cliff.” We were now totally on board and had a lot of work to do, so we got started right away with biweekly private obedience lessons. Once we got rolling, I kept feeling better and better about my decision. Not only was Karyn utterly compassionate towards Gecko, I liked her confidence and the energy she brought to her work, but most importantly, I trusted her. 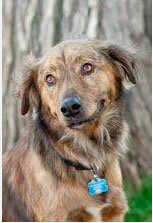 I knew Karyn was not fond of Cesar Millan’s Illusion collar; however, she did not dive right into the electronic collar. Early on, she had taught me the collar hierarchy, starting with mild and working our way up: head collar > slip collar > prong collar > electronic collar. We both already knew a head collar would be insufficient for an aggressive pit bull like Gecko – in the “heat of battle,” she definitely could shake loose. Slowly, but surely, Karyn introduced different collars, as she truly wanted to use the collar which was the least aversive, yet effective. The slip collar was not effective. The prong collar worked more efficiently than the slip collar (fewer “corrections” needed), but Gecko still re-directed on me. We did not want to use more force than necessary, but we had systematically worked through the progression of collars, and none of them could effectively stop Gecko’s vicious behaviors towards other animals. Looking back on it now, I can see how this systematically got me psychologically prepared as well. The next tool in the toolbox: the e-collar… we took that step on December 1st. Karyn’s acumen with the e-collar was obvious, and she carefully walked me through every aspect of this powerful tool. She explained the wide range of settings, from mild to intense, and I even tested it on myself…with Karyn’s guidance, of course! She positioned it in the palm of my hand, and began progressing through the levels: ½ to 5, with increments of ½. I got to 2 and stopped. It was not painful, yet it definitely got my immediate attention in a strange sensory kind of way. I could barely feel the low levels of ½ and 1. Soon after, Karyn strapped the e-collar on Gecko, and the three of us went for a real walk in the real world with real dogs. I was amazed at what I witnessed that afternoon. With Karyn at the helm, we purposely encountered dogs on the grounds of Gavin’s Pet Plaza, and it was not a crisis situation. At the first sign of aggression, Karyn pressed the button on the transmitter, and Gecko instantaneously refrained from her aggressive behavior. Yes, she flinched. Yes, she was receiving an uncomfortable stimulus. Yes, this was all new to her. However, she stopped her inappropriate behavior immediately. And we got on with our lives…without jerking, without yelling, without choking, basically, without violence. All the while, Karyn was an agent of calm. I was impressed. Karyn lent us an e-collar and sent us on our way. Gecko and I came back three days later for our obedience lesson, and Karyn was curious about our experiences with the e-collar. I summed it up with one word: “stellar.” Basically, it changed our lives. Large amounts of stress were alleviated from our lives. I had the opportunity to be impeccably consistent with Gecko’s behaviors: positively reinforce the wanted behavior, and effectively punish the unwanted behavior. As the weeks clicked off, I saw that we were making great strides – Gecko was not automatically acting out viciously at certain spots on our daily walking routes. Moreover, our relationship was growing stronger, and I attributed this to being much more aware of – and reinforcing – all the good behaviors she manifested. When I analyzed a typical day, Gecko’s behavior was appropriate more than 99.5% of the time! The sixty seconds (or less) she acted inappropriately on any given day was dealt with swiftly, effectively, and calmly, and then totally left in the past. This was a great lesson for me as well – I needed to replace anger with calm, effective leadership. As a result, joy and harmony were becoming more and more prevalent in our little home. Gecko seemed happier – she was more wiggly and her tail was wagging a lot more. Karyn immediately noticed Gecko’s improved attitude, and skillfully integrated socialization with other dogs into our private lessons. Karyn carefully introduced her own dog, Luke, an obedient and balanced yellow lab, to Gecko. In a controlled environment, under Karyn’s keen supervision, we watched Gecko and Luke fully engage in playful behaviors. In fact, things went so well, Karyn removed Gecko’s muzzle! Hope was there – we witnessed it! I felt great as well as grateful. I was now feeling much better on several levels. I was not constantly worrying about taking my dog outside, my stony heart finally started to come back to life because I was remembering how good it felt to care about others…and hope was now part of the mix. As of January 4, 2009, I feel both energized and peaceful at the same time. For a person in my situation, living in Tucson, Arizona, I know Gecko and I ultimately ended up in the optimal scenario: working with Karyn Garvin. Speaking of work, I realize we have a mountain of it ahead of us, but it’s the good kind of work, the kind you can’t wait to get to in the morning. I am also aware we have an exemplary teacher in Karyn Garvin, who has opened my eyes to a variety of problem-solving strategies and tools. My goal in this particular arena is for Gecko and myself to eventually lead genuinely healthy, fulfilling, and balanced lives. My inner voice tells me we are on the correct path, and I am truly grateful to have this special little dog in my life – she has already taught me so much, and I have a feeling there’s much more to come..
On the weekend of February 28th, 2009, Karyn and Luke took Gecko and I to St. David, Arizona for several days of off-leash training in the wilderness. Karyn has a travel trailer parked adjacent to a vast and beautiful swath of southeastern Arizona desert, a perfect venue for this type of work. 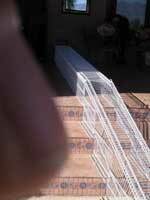 Prior to the trip, Karyn instructed me to fabricate a 30-foot long-line with big knots tied every three feet. She also warned me about the risk involved – it was possible that we could lose Gecko out there. Despite the risk, I chose to proceed. Our first exercise was a hike from the trailer. Gecko was muzzled and had the long-line attached to her e-collar, which, by the way, has a half-mile range. Luke was her personal guide, a role he filled impeccably well! The four of us scaled the barbed-wire fence via a well-built ladder structure, and headed due East into the openness and late afternoon chill of Cochise County. The goal was for Gecko to be off-leash and not run away. Moreover, with Luke’s exemplary guidance, she was learning to “check in” and wait for Karyn and I at about 30 yards out, and, come back to me when I called her. The e-collar and long-line were back-up tools just in case she forgot how to behave appropriately. I would administer a moderate correction with the e-collar in order to regain her attention. 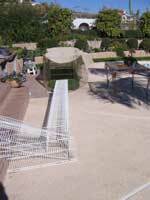 Also, if she did bolt, the 30 feet of knotty long-line would slow her down significantly, as it would definitely snag on the thorny Sonoran Desert vegetation. The knots could also be helpful in preventing rope burn on our hands if we were ever holding the long-line and she decided to make a break for it, or, we tried to grab it as she was running by. Luckily, none of these scenarios played out! Luke, the consummate professional, modeled splendid behaviors and Gecko followed his lead. Since it was late Winter, there was very little, if any, wildlife running about, so their allegiance to us was quite strong. On several occasions, I used the e-collar to re-focus Gecko on following commands, and it worked well. 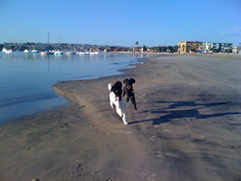 The dogs had a blast and burned off a lot of energy, Karyn was pleased with Round One, and I was a happy camper. Part B consisted of taking an exhausted pit bull on a hike off-leash. The four of us headed into the foothills for a relatively short jaunt, and once again, Luke manifested strong leadership. Gecko was muzzled and equipped with her e-collar, but I never needed to use it. She did great work out there. By now it was midday, and we headed back to the trailer in St. David. 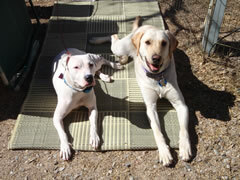 Except for some potty breaks and a dinner break, Luke and Gecko slept soundly until the next morning…good, tired dogs. I was very happy with the progress Gecko was making in her training, but even happier for Gecko as a dog, living in the moment – running hard, breathing deeply, sniffing everything, and resting peacefully. Day Three, Round Three: This was it…time to pull it all together. We left the trailer with the dogs on-leash, and walked through the campground to the same ladder structure that scaled the fence and served as the gateway to the big desert. Once we dropped in, it didn’t take long for the campground to disappear from our line of sight. At that point, we removed the leashes from our dogs, who were both wearing e-collars; Gecko was also wearing her muzzle and long-line. Luke and Gecko joyfully trotted off together a little ahead of us down the trail. I took a deep breath, knowing this was the real deal. That is, I knew I was about to get some answers about my dog’s character: defiant or compliant? I was also aware that I must live with the consequences of this training session, no matter what the outcome. I once again gave Gecko the independence to make her own decisions out there, and at that exact moment, she knew I trusted her. I could tell by the way she looked back at me and made eye contact. And because I trusted her, I knew she would not let me down. Our relationship truly solidified that day, and the bond between us has been growing stronger ever since. One week after the “St. 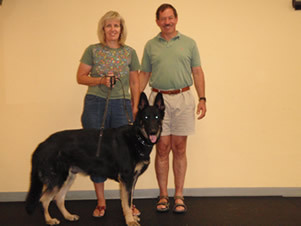 David Experience,” on March 9th, 2009, Gecko began her first group obedience class. Karyn considered this one of her “Reactive Dog Classes,” as every dog enrolled had displayed aggression to either a person or another dog (or both) at some point. All the dogs wore muzzles, and two e-collars were present – Gecko’s and Sadie’s. I had some trepidation due to the personalities of the other dogs, but Karyn said it was time, so I made the commitment for the next eight Monday evenings. It was as much an emotional commitment as it was showing up on time each Monday night – I made a very conscious decision to keep Gecko’s best interest at the forefront of my mind, think positive thoughts, and practice our skills each week. Our first class was low-key, more of a Meet-n-Greet session with some heeling and sitting exercises mixed in. None of the dogs aggressed… Hurray! A couple of other great things were happening outside of group class as well. First, Gecko was developing a very strong friendship with another pit bull in our neighborhood – “7-UP” lived a few doors down the street from our apartment. A big, young, intact, happy-go-lucky boy, Gecko loved him even though he was confined in a chain link yard. Also a former stray, he was given refuge by an elderly women, who could only take care of his most basic needs – food, water, and shelter. Needless to say, he became ecstatic in Gecko’s presence, and she eventually reciprocated. We visited twice each day, and always had three biscuits for him; he learned to sit in no time flat! The amazing thing about this relationship was its progression – it closely mirrored Gecko’s improving social skills. The first few times we walked by 7-UP’s yard were horrific…yep, vicious aggression from Gecko. The other great thing took place on March 15th, 2009. Applying the skills we learned from Karyn on the St. David trip, Gecko and I did a “Running Tethered to the Car” session in the Santa Rita Mountains along winding, almost deserted, ranch roads. It was a splendid Spring day in the high desert. We both did a super job out there – Gecko ran five miles with her e-collar and muzzle, and I made many good decisions that kept her safe and sound while she was running. At the end of the that exercise, I felt good and confident, and I know Gecko felt good and tired. …another healthy, positive change transpired for Gecko and I: I bought a house with huge, securely fenced yard in a nice, quiet neighborhood! We had fallen in love with this place the first time we had laid eyes on it, and now it was ours. Timing is everything… I had been looking (and saving) to buy a home since 2004, but simply could not afford what I wanted…until now, with its favorable, almost unbelievable, buyers market. Additionally, our apartment living situation was so unhealthy on many levels for both of us, but mostly for Gecko. We were surrounded with emotionally and psychologically toxic energy: inconsiderate, loud, drunken people, whose cigarette smoke wafted into our living space, and their couped-up, neglected, aggressive dogs were adjacent on all four sides. The neighborhood was busy and noisy with Salpointe High School and University of Arizona traffic, and gunfire rang out very late at night on a regular basis. Finally there was the “yard” – it was the size of a cracker box, and had absolutely no visibility because it consisted of planks of wood 6 feet tall. I just knew I had to get Gecko out of there…Timing is everything. There was the dog walking situation: Three lovely neighborhood parks within a one-mile radius of our home! The options, routes, and loops were practically limitless, and this was awesome because we walked/ran 3 to 4 hours everyday. Remember that growing list of Gecko’s dog friends I mentioned earlier? Well, except for Luke Garvin and 7-UP, those dogs resided in our new neighborhood. Gecko and I really loved our new place. Gecko’s happiness spilled over into her daily behavior as well as her performance at group class. As our “Reactive Dog Class” neared completion, it was evident that it was a special group; none of the dogs had an outburst of inappropriate behavior, and the human energy was healthy and refreshing. 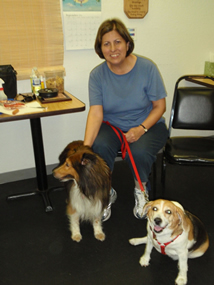 Karyn, who has been a dog trainer for thirty years, told us that this was probably one of her best classes ever. It was heart-warming to be part of something like this, witnessing this particular group of dogs making great decisions and being successful. In our last session, all the dogs were lined up next to each other on their spots, muzzled, and did a five-minute sit/stay while all the handlers were out of the room – it was very touching. Everybody received their Certificate of Graduation on April 27th, 2009. Gecko’s diploma has been matted, framed, and displayed in the living room of our new home. After graduation, I noticed marked improvement in Gecko’s behavior with other dogs when we were out in the community…which was very, very often. I was totally psyched because social and obedience skills in the real world were all I ever wanted for Gecko. A corner had been turned and it was happening right before my eyes! The sudden clarity of her progression was amazing: private obedience lessons>group class>application in the real world. Now when we saw another dog, she was very aware and curious instead of automatically exploding in a fit of viciousness. I would put her in a sit/stay while the other dog passed by, and she complied. After they were by, she “needed” to sniff their trail and urinate on it, and I would allow this…I figured it was a fair trade for the aggression-free encounter. 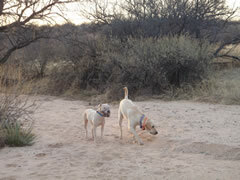 Occasionally, the other dog was sweet and its handler intelligent, so simultaneous sniffing and playfulness ensued. As Spring gave way to Summer, we kept up with our daily long walks and mini obedience lessons. Every single time Gecko left her yard she wore her e-collar, and it was barely used as an aggression intervention tool . Nevertheless, it has given me such peace of mind, and has made it possible for us to get out and experience a small slice of the world together. At the end of our first group class, Karyn had mentioned enrolling Gecko in another group class over the Summer in order to maintain and improve upon the progress she had made thus far. We began our second group class on June 15th, 2009. This was a nice little group – only four dogs – and a great way to brush-up on our obedience and socialization skills. Gecko was the only dog in the class that had previous aggression issues; Leo, a golden doodle, and Lila, a golden retriever, appeared happy-go-lucky, and Biscuit, a beagle, seemed fearful and somewhat grumpy. Oh yes, Luke was there to help out as well! Things got off to a smooth start for the dogs, but my handling skills were noticeably rusty, and Karyn brought this to my attention in no uncertain terms. At that moment, I knew I had to be much more psychologically and emotionally present in order for Gecko to be successful. Right then, in that class, I re-committed myself to Gecko’s journey. First, during one class, we walked by Biscuit, the beagle, and he snapped and growled at Gecko. She absolutely did not react to him. Then, on July 20th, we were on our evening jaunt and came upon a woman walking three dogs. We had encountered this pack a couple of times before and the two parties were slightly familiar with each other. However, during the sniffing stage, one of the pack members changed its mind about being nice, and became aggressive towards Gecko…and she handled it perfectly! She did not reciprocate the aggression, she stayed calm, and came to me instantly when I called her. She was not wearing her muzzle and I did not need to use the e-collar. Gecko received tons of positive reinforcement, and this particular incident made all the time, energy, and training worthwhile, because she transferred what she learned in school to the real world. As group class rolled on, both the dogs and the handlers continued to progress. There were no more canine outbursts; moreover, Gecko seemed to like Leo and Lila, but especially Leo. So, after our second to last class, we carefully let these three get a little more acquainted with each other. After the sniffing phase, Leo gently and playfully put his very large paw on Gecko’s shoulder, and she was fine with it…but…Luke Garvin took exception to this gesture! He did not overreact, but he definitely reacted: Twice he jumped up from his spot and barked at Leo as if he was protecting his girlfriend! Or, was Luke jealous…? Luke’s behavior that day was quite surprising and funny…even cute! Yep, Gecko and Luke have been buddies since the very beginning. 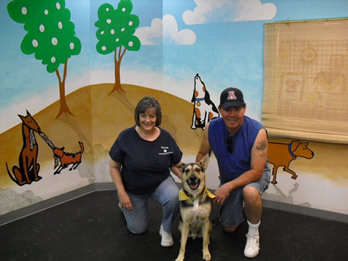 Miss Gecko graduated from her second group obedience class on July 27th, 2009. While Gecko’s inter-dog aggression has diminished almost entirely (she has had one minor flare-up in the last four months), her prey drive remains incredibly strong. Every single time we leave our house for a walk, Gecko incessantly pursues every small animal she sees – everyday, every one, every time… The hierarchy of her daily targets is as follows: 1) Cat, 2) Rabbit, 3) Squirrel, 4) Lizard. She is an emphatic huntress, willing and able to climb a wall, fence, or tree to reach her goal. The Nature vs. Nurture argument instantly comes to mind. I am not a veterinarian, nor a psychologist, but based on what has transpired over the past year, it sure looks like her aggression was a conditioned response and her prey drive comes from her DNA. I have not tried to extinguish her prey drive the way we worked on her aggression because they are two very different behaviors – I see a major difference between aggression/viciousness and enthusiasm/vigor. I am also very cognizant that Gecko is a dog, namely a young, high-energy, American Pit Bull Terrier. She can turn the prey drive on and off like a faucet; when she is in the house, in the yard, in the car, or at school, her behavior is excellent. This fact makes me think about her gene pool…Getting back to the nurture side of things, in addition to consistent behavior modification (reward desirable behavior, punish undesirable behavior), Gecko has also had an extremely stable, healthy, and loving home for the past year; she thrives on her routine and enjoys life. Her forever home certainly has had a favorable influence on her behavior. I am thrilled that her inter-dog aggression is under control, and I “pick my battles” regarding her tremendous prey drive. Even if I tried, I could not safely delete Gecko’s desire to chase other animals. I choose to manage Gecko’s hunting behavior when we are out in the community, and sometimes I need to use the e-collar. For me, the bottom line is that I accept Gecko for who she is and I love her. The future for Gecko and I includes continuous improvement, challenges, and adventures. I have given quite a bit of thought to two such adventures, and one, which includes a bicycle, has actually already started on a very small level. It was born out of necessity – Gecko is now two years old and in her prime, and I am past my prime, but she still needs a lot of good intense exercise everyday. I call it the “Bicycle Integration Plan,” and it begins with an appropriate bicycle. I own a couple of high-end very expensive road racing bicycles, and although they’re super fast and super light, they’re utterly inappropriate for this application. I bought a one-speed kids bike with coaster brakes, platform pedals, upright handle bars, and a banana seat…perfect for this job. The only other pieces of gear necessary for this endeavor are a bike helmet, harness for Gecko, sturdy belt for my waist, a rock climbing caribiner (rope clip) to attached Gecko’s leash to my waist, and her e-collar. Please keep in mind that the primary objective of this system is quality exercise for Gecko. Gecko wears her e-collar and her harness, but is leashed only to the harness. A five-ft. leash is clipped into the sturdy belt around my waist, which is also my stable center of gravity. Holding the transmitter in one hand, and braking with my pedals, we move along at 10 – 15 m.p.h. Once the weather cools down, and we are more seasoned, Gecko will have the opportunity to cruise along at higher velocities. If Gecko lunges after a prey animal and goes berserk, she will be corrected assertively with the e-collar. Crashing is unlikely because I have very good bike handling skills, I weigh 100 more pounds than Gecko, and I need only to stand up to be back on stable ground. If a wipe out does come to pass, it most likely would be a minor glitch – I would only fall two feet and damage to the machine would be negligible. In any event, our first spin around the block this Summer was extremely promising! The other adventure entails hiking and backpacking with Gecko Lilly Blossom when the weather is more conducive. Now that we’re out of “Dog Aggression Crisis Mode,” I feel ready to begin Gecko’s back country education and etiquette program. This, too, will be a process, not an event. I’ve broken it down into the following pieces… 1) Set-up the backpacking tent in the living room of the house and let Gecko play around in it and sniff everything. Put the sleeping bags and air mattresses in it, and try to have her sleep the night in there with me. (Repeat/modify as necessary.) 2) Same as #1, but set-up the tent in the backyard and try to spend the night together outside. (Repeat/modify as necessary.) 3) Do a car camping trip in the real world and sleep in the tent; if things go awry, sequester Gecko inside the vehicle until morning. (Repeat/modify as necessary.) 4) Go on a one-night real backpacking trip and see if Gecko can get through the night despite the surrounding wildlife. If so, build up to multi-day backpacking trips, say 3 to 5 days. Due to her innate personality, I have decided to keep Gecko on-leash while in the back country and she will always wear her e-collar. Again, I will clip her leash into my sturdy waist belt. It’s not because she will chase wildlife – I know this will happen, and she probably won’t catch anything. It’s because she could get lost, injured, or killed in her relentless pursuit. Also, when we’re at our campsites, she will be tethered on a long line with a comfortable place to rest. At night in the tent, until I see how she handles the “bumps in the night,” she will wear her e-collar and be loosely leashed to my waist so she cannot rip and tear her way out, thus ruining our shelter. I plan to take this whole backpacking process slowly and see how it goes. Of course, we will continually practice our obedience, hiking, and backpacking skills, and work on Gecko’s off-leash behavior whenever the climate and conditions are appropriate. I sure hope she can “get with the program” enough to go with me; if not, she will have to stay at home in the city with a dog sitter. I also think about her young age of 2-yrs. and the role it plays in everything. Gecko has always been a pretty mellow dog, so I wonder if maturation will calm her prey drive down a bit…we will see. Maybe someday she will hike and backpack off-leash with me. One thing is for sure though – I love Gecko immensely, backpacker or not. August 3rd, 2009 – Today I sit here and finish writing this chapter of our story. It also has been exactly one year since Gecko came into my life…Coincidence? Whatever the case, I am truly grateful for her presence. Little did I know then that one year later, we’d have a worthwhile story to share. It’s a story of survival, personal growth, and peace of mind, but mostly it’s a story about hope. Know that there is hope for unique dogs with unique behavioral issues. Gecko Lilly Blossom is living proof! As you well know, I arrived in your office in April, 2009 with my dog-aggressive Standard Poodle named Lola. Lola tried to pick a fight with the statue in your lobby and then even nipped at sweet Luke who was brought out as a “test” dog. Over several weeks, we worked on basic training issues and I quickly discovered that Lola really liked to “think”! She picked up new tasks easily and enjoyed coming to her training sessions. Her confidence grew and when we introduced the bark collar, her aggressive behaviors started to dwindle. I could take her to Petsmart without fear that she would growl or bark; she went for walks in the neighborhood without going ballistic upon sighting another dog. We then introduced her to training with other dogs, and while she is still nervous in the presence of Luke and your “Doodle”, she no longer acts out with aggressive behaviors. She has even been to doggy day care where she mostly stuck to her human companions, but nonetheless, received glowing marks. In fact, her behavior improved so much that we decided she was safe to travel with us to San Diego for beach holiday in August. I’ve long thought that Lola was able to identify her breed. She had immediately taken to Shotzie (spelling?! ), your Doodle — even trying to sit next to him on his bed. We took her to Ocean Beach in San Diego which has a dog beach. 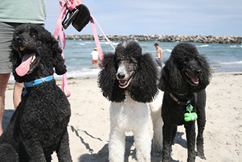 She was fairly overwhelmed by the number of dogs on the beach and was content to sit between my husband and I — just taking it all in….Until, a Standard Poodle named Jake showed up. Lola spyed him coming along the beach and I saw her tail start to wag. She ventured away from us to greet him. Jake too seemed to identify Lola as “one of his own kind” — Jake was the only dog on the beach that she felt comfortable with (other than Penelope). Attached is a photo of Lola with Jake on the far left — and her “sister” Penelope on the right. Lola and I can’t wait to start agility training! Nena came in to our training facility terrified of walking her dogs out in public. She had her reasons for being fearful but she was overpowered by fear. Her dogs were older, gentle and easily manageable but Nina’s fear… was holding her back more than anything. My job was to give her some leverage, discuss why she’s afraid and then literally attack her rehearsal of why she couldn’t and empower her with how she could. When she started whining and rehearsing her why she couldn’ts and started going into that dark deep hole I sprinkled her with water from a glass to change her state. It worked! It didn’t take long for her to start laughing as she caught herself starting to go down that dark hole so that she wouldn’t get sprinkled… (or corrected). Next I showed her the technique of walking a dog on a loose leash. I also gave her new hope by suggesting that she walk her dogs in public areas. Sure you have to listen to cars if you walk down Kolb but you certainly are less likely to run into loose dogs or have to pass by yards of dogs that would come after you if they got out. I want to say thank you sooooooo much for “An Explanation” – it is absolutely beautiful and so true. I love your faith and the way you use it in everything you do. You are truly blessed! I couldn’t get the grin off my face and Luna was literally bouncing and prancing – what an experience! And, it’s all thanks to Karyn Garvin. I met with Karyn for two hours and in reviewing my fears about walking my dogs, I discovered that I was afraid due to some run-ins with dogs in the past – particularly a big dog that scared me when I was a child and a Rottweiler that attacked my Sheltie in front of my vet’s office. After our conversation and some teasing, Karyn gave me the courage to try to walk Luna, my Beagle, while her big dog was in the room. I must admit that I was ready to say “no” but decided that I had to try. It went well and then she suggested I try it in front of two other dogs – that’s when I was ready to say “never mind!” However, I walked my Luna and amazingly, learned what I needed to do to keep her under control. She fell right in step and it was a lot easier than I thought it would be! I was so glad to have an expert help me realize that I can do it and teach me what I needed to know. The result of the two hour session is that I have now walked my dogs twice – separately – but I will build up to being able to walk them both at the same time. The other piece of great advice she gave me was to walk my dogs near a public, business area as opposed to a residential street. I have been so afraid to walk my dogs in my neighborhood because there are loose dogs and children walking big dogs. I have now gone to public places and it’s working well. Now I look forward to taking both my dogs out and I love how they enjoy it. It is going to be good for all of us. Now, if I can just get the grin off my face! I can’t thank you enough for the help you gave me. Do you have a dog that you love but you’re frustrated because he/she won’t mind? You would like to train her but have been unsuccessful in your attempts? Let me tell you my story; there is hope. I got a Rottweiller when she was barely 8 weeks old. I took her to training at one of the local pet stores and she showed me how smart she was, but I wasn’t happy with their training…it was too set in their agenda as opposed to mine. While the trainer was good he did not have a lot of experience and had had just an eight week training class himself. I did not continue after that class ended. In March, my 75#, 7 month old puppy pulled me off my feet and I broke my pelvis. I didn’t blame her, I knew that I had not trained her adequately, but I didn’t know how to do so without breaking her spirit. Then I found Garvin’s Pet Training. What an eye opener! The first session we had was devoted to talking to me and finding out what I expected and wanted from the training. I told Karyn that I knew it was a two part process, not just training Geri, but also training me to do the training correctly. After just 8 sessions, I have a pet that pays attention, and has gained quite a few manners. We are still a work in progress! We have completed our private lessons and are beginning to embark on training in a group class so that Geri and I can learn to maintain the obedience and control while others are around; i.e. with distractions. Karyn is not just a dog trainer; she is very good at finding solutions to problems that you are experiencing with your pet. I now have a dog door, which I was pretty set against, but it has been good for both Geri and me. Karyn suggests solutions and gives you options which has been just as important for me as the actual training. Her years of experience shows. I have gone from thinking I may not be able to keep this dog to now owning the dog I dreamt of. 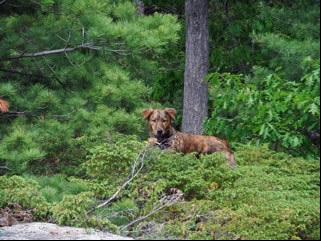 Camper was rescued April, 21st 2009 in Tucson Arizona; he was running with a pack of coyotes on land owned by the Federal Government. He lived on cleared land that was home to the Federal Penitentiary and the Federal Prison Camp. From information given by Officers working at this facility he was abandoned at about twelve weeks of age. Even then he was “skittish” and could not be caught. A coyote pack befriended him and taught him the survival tactics he needed and used for the next two years. Several staff members tried to catch him and on two occasions an expert in capturing feral animals was hired to capture him by Pima County. All failed, he was just too smart to fall for the traps they set. Over this time he “earned” many names; Skitters, Mobile 3 and Bureau, and after his rescue I named him Camper. A year and a half after he was abandoned my friend Vera was assigned to work at the Camp and began the mission to befriend and help this wild dog. Vera deserves the vast amount of credit in initially gaining his trust, she worked on him for three months before I came to work there. There were several other staff members and inmates at the Camp who also helped feed him before we began to help him. They would leave left over food (including pancakes and Egg McMuffins) out for him to supplement what he and his pack hunted. Vera began bringing dog food for him and placing it and clean water in the same spot and asking those who fed him scraps to stop. For some reason he would not share this food with his pack. Then I began working at the Camp from 4:00pm until 12:00 am and Vera was assigned to work from 12:00 am until 8:00am. Initially he was without food and water from 8:00 am until I arrived at 4:00pm, but after he became more socialized the permanently assigned staff working during the day would fill his water bowl and thankfully the administration “looked the other way” while we worked to gain his trust. Other correctional officers working at the Camp helped to feed and water him when Vera and I were off, and we are especially grateful for Jose and Chuck’s help during this time. We started slowly moving his food and water was closer and closer to the main entrance to the Camp until it was set just outside the main door. He started waiting for us to come to work and then he began greeting us at our cars with his tail wagging. As he progressed he would let us touch and pet him, but we could only use one hand. If we started to put our other hand near him he would jump back and run away. He was so skittish that Vera named him Skitters. Then a strange began happening. As we left work for the day he would go out in front of us, scan the parking lot and run off any coyotes there before he would “let” us into the parking lot. One religious volunteer told us that he was doing the same thing for him too. And then he began to help other staff in other very special ways. He would alert the officer on duty when contraband (anything unauthorized at a prison) was dropped off in the desert for inmates to retrieve later. He found tobacco, liquor, cell phones and food being left in the desert. He was nominated as “Officer of the Month,” and one supervisor told me that he was even nominated as “Officer of the Year”. Camper was getting very good at finding contraband and we become worried that an inmate or someone from the “outside” would attempt to stop him from alerting us. Our efforts to capture him were doubled. We were afraid for him; afraid we would not be able to capture him before someone harmed him. Twice we brought out crates and attempted to put him into it, and on the advice from a veterinarian we gave him medication to help calm him. We tried for hours but we could not capture him. Each time we would be in a position to grab him he would jump and run away. It was obvious that Camper had an ear infection. The cartilage in his right ear was broken and the inside of his ear was nearly swollen shut; he was constantly scratching at it and shaking his head. We tried to get antibiotics but of course no vet would prescribe them without seeing him and the mobile vets would not return our phone calls. We worried about rabies and distemper and heart worms. Vera and I knew we had to give capturing him another try. At 1:00am on the 21st of April 2009, while all the inmates were asleep, I drove to the camp with a big meaty soup bone. I pulled up to the front entrance where Vera was waiting, and of course Camper was right beside her. Vera took the blanket she had brought for him to sleep on and placed it in the back seat of my car leaving the rear door open and laid the bone in the center of the seat. I stayed seated behind the wheel and Vera and I talked in calm voices pretending to ignore him. We watched as he stretched his neck trying to reach the bone; he put one paw into the car and stretched further. Finally he placed both front paws into the car and stretched again. Vera quickly grabbed his rear and pushed in up into the car. Quick as lightning he turned around and tried to get out but I grabbed him under his rear end and she shut the door. The realization that I had a half wild dog trapped in my car then hit me, it was a bit scary. We had no idea how he would react. I was surprised when instead of becoming aggressive he began to whimper. Vera stood there, happy, but with tears in her eyes, and Camper and I drove off. During the 15 minute drive home he sat still and continued to whimper on and off. When we pulled into the driveway my husband was waiting with a collar and lead. Putting that on was surprisingly easy, trying to get him out of the car was hard. Finally I pulled on the blanket he was on and out he came. He stayed the night outside and I slept outside on a lazy boy chair wrapped in a sleeping bag to keep him calm in his new environment. The attention he was given at the camp paid off, and though, he was obviously scared, he never once became aggressive towards me. I have four other four legged furry kids at home and my husband Ricky and I wanted to keep Camper separated from them until we had him cleared by our vet. (His appointment was four days away.) Ricky put up a temporary wooden partition separating our courtyard from our backyard. Our kids would be let out back and Camper in the front and then reversed using the house as our sallyport. On the third day I put our kids in the back yard and Camper out front. After a few minutes I went to check on Camper, I opened the front door and there stood Frankie, one of my other kids. I ran to the partition and found that Camper had pushed it aside, my heart was pounding rapidly. All I could think of was a huge dog fight. I turned the corner and was so relieved to see Camper and my other three kids chasing each other, jumping and just having fun together. Ricky took the partition down. The day of Campers first appointment Vera came to help. After chasing him around the yard we got a collar on him and put him into my car. We had to push him through the door into the vet’s office; he was very scared and skittish. The vet confirmed the ear infection and then told us he had found heart worms. He explained that the coyote population in Arizona has a high incidence of heart worms and that since hurricane Katrina dogs from that area which move here increased the incidence of heart worms in his office from a very few per year to 2 to 3 a month. Needless to say this treatment was heart wrenching, and extremely hard on him. After his complete recovery, immunizations, and time spent learning to live our family we realized he needed specialized training. 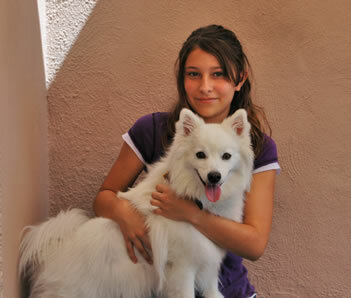 It was at this time I began researching trainers in Tucson and was thankfully led to Garvin’s Pet Center and Karyn. 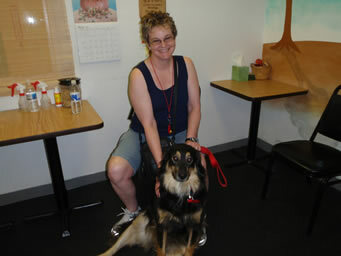 Rick, Camper and I began individual training in October of 2009. He progressed slowly as obedience was something completely new to him and to us; even wearing a collar was a relatively new experience. Karyn taught us to be patient with him and she helped him trust us. Karyn was wonderful with us as we all learned and advanced through her program. 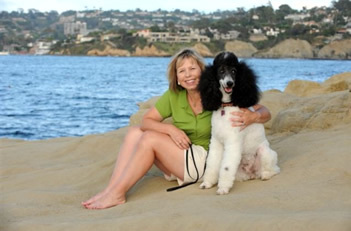 We found Camper had several unique problems due to his different beginnings, and as each one was discovered Karyn had the answers and training exercises he needed to overcome them. We all learned more than I though was possible. One thing Karyn helped me to understand was that while I thought he had a trying and rough beginning in his life, he didn’t see it that way at all, he didn’t know he had it rough, that was his life. After five months of individual training Camper has moved on to group training with Moria. That’s where we are today. We have a wonderful relationship with Camper, he is a pleasure to be around and entertains us with his antics and playfulness with our other furry children thanks to Karyn and her training all of us! He truly is a “happy Camper” these days. Thank you, thank you, thank you for helping us turn Sparky into a great dog. David and I are amazed at how far he has come in just 11 months. Your help from day 1, before we even found Sparky, has taught us how to be good dog parents and bring out the best in him. We recently returned from 6 days at our cottage in Ontario, Canada. 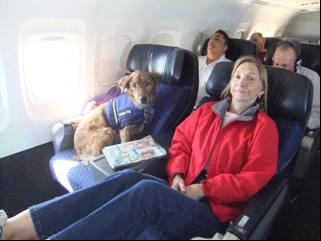 Thanks to his service dog training, Sparky flew with us in the airplane cabin. He behaved perfectly, laying at our feet during the flight. We did let him sit on the seat for awhile because he enjoys looking out the window. Thanks to his obedience and agility training, changing planes at hectic and crowded Chicago O’hare airport went smoothly. The agility training gave him confidence as we maneuvered and wove through the crowds, walked down the jetway, climbed up and down a steep stairway for our second flight and walked on different surfaces. He also happily napped during our 4 hour delay. By the time we arrived in Toronto he had held his bladder for 10 hours! Once at the cottage, again his training made a huge difference. Despite all the scents of the forest, he stayed with us and came when we called. Your teaching us how to use the e-collar also made us feel more secure while having Sparky off leash. He was not afraid to walk on a narrow, floating dock and quickly learned to jump in and out of the boat. Within 30 minutes of arriving at the cottage he was swimming in the lake. I think he must have thought he was in doggy heaven….cool, green, lots to sniff and swimming too! Sparky has become a wonderful dog and has brought so much joy into our lives. Your advice and training has helped make him a true member of our family. My e-mail from Nena, after her first appointment. 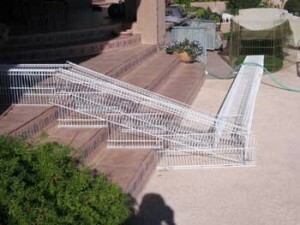 In Arizona, many of our customers need to allow their small dogs access to the outdoors, yet keep them safe from the local wildlife. Here’s a look at what Tom Covell created. I made the run out of the wire shelving usually used for a closet. I got these at Lowe’s and tied them together with wire and made sure to bend the ends so that it would not get an eye or paw or hand. The size I used was the 12″ wide but they do have 16″ wide shelves that would do for a bigger dog. I used a abrasive saw to cut the pieces going down the stairs. It probably cost me about $150.00 to buy the material but I don’t think it took me an hour to put it together. If you need some more information let me know. Hopefully the pictures are good enough for you to understand what was done.